From a technical standpoint, is there a reason that the galaxy code could not be modified to rotate? I only suggested it because they are the right-sort-of-shape for PP discs, and I felt a sprite cloud like a galaxy (properly customised) was more representative of the image in my head than a planetary ring system. If you talk about sprite model, then yes, something like this will be used for protoplanetary and accretion disks. But if you talk about stars in the galaxy - then no, it is impossible to make them move. Yes, I thought about it. It is a sort of volumetric fog made by pre-computed texture. But problem, as always, with transparent objects. I tried to make a bulge for spiral galaxies using the same effect, but sprites simply incorrectly blended with bulge on background. I think similar issue will be with dust sprites in a proto-planetary disk, with planet's atmospheres and rings. What about using this for zodiacal light ? Thanks for the reply, Space Engineer. Yes, I was talking about the sprite model, rather than the stars. I don't really think the stars have much use in a protoplanetary disc. As for the gas giant atmosphere examples you posted - beautiful! Are bump maps generated by the engine for Gas Giants? I haven't noticed them being applied - it certainly helps the realism on Jupiter and Saturn. And on the subject of Gas Giants, the last time I tried to fly into one, my ship collided with the "surface" layer. Is there a way to turn that off for gas giants? I know that what you'd see inside wouldn't be pretty, but I'd rather be able to use the new atmospherics in 0.98 for aero-breaking or simply diving inside them. Edited for clarity, and also because I realised that deceleration requiring aero-breaking to that depth would probably leave my ship toasted. ndeed, and the favorite locations save list becomes a mess too, when you start to get hundreds of found planets. The browser should be made to easily navigate through thousands of saved locations, with icons and sortable lists. Are bump maps generated by the engine for Gas Giants? it certainly helps the realism on Jupiter and Saturn. No. Did you ever see a photo of Jupiter and Saturn where shadows of clouds on themselves was clearly visible? I didn't. No. Atmosphere can't render without opaque base sphere. Anyway, in game you ship will be destroyed by pressure in much higher atmospheric layers. q: can we expect moons with rings now? Like Rhea? 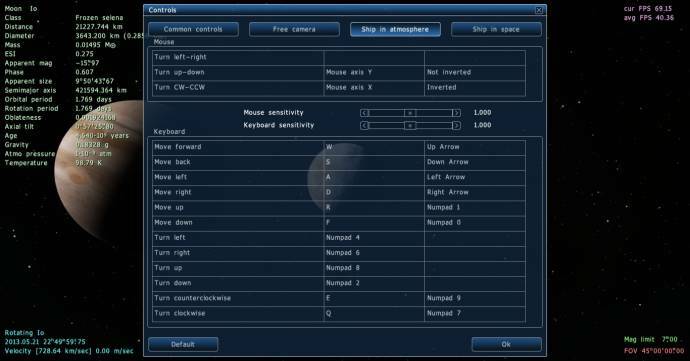 No, debris ring is implemented as improvement of the moon system generator code, so they generated only around planets. Generally speaking, I don't like the results (appearance and especially performance), so I'll probably remove it in the release. Some bump details are visible on Jupiter's photos. It is rare to see them because 1) close image of Jupiter are rare and 2) those "bump" details are small compared to the size of the planet. There's a storm glowing through the "black haze" of Jupiter's shadow. I think implementing bump maps for gas giant clouds is not a good idea, as it looks strange (Destructor1701, you can implement a bump map on Jupiter's clouds bt adding "BumpMap "Jupiter/Clouds-01" BumptileSize	256 BumpHeight 10.0 BumpOffset 0.0" to every cloud tag, but the result is pretty ugly). Normal maps on gas giants, visible only frome close distance, should be a better idea. Edit : maybe that's not a good idea to remove debris discs, as some people found interest in this. Maybe this could be disabled, but with a config in main.cfg to enable this. I don't think that's a 'bump' effect, just an effect of image/contrast enhancement with the anticyclones being intrinsically slightly brighter than their surroundings. May possibly also be from slight sensitivity of the camera to near-IR. Self-shadowing in Jupiter's clouds is almost completely invisible, or I've at least never seen a clear example of it, even in much higher resolution images of the terminator. looking at the Jupiter pic, is it possible for gas giants to have a bunch of small storms like that in-game? I think implementing bump maps for gas giant clouds is not a good idea, as it looks strange (Destructor1701, you can implement a bump map on Jupiter's clouds bt adding "BumpMap "Jupiter/Clouds-01" BumptileSize 256 BumpHeight 10.0 BumpOffset 0.0" to every cloud tag, but the result is pretty ugly). Normal maps on gas giants, visible only frome close distance, should be a better idea. Yes, I have already done this. I also separated the layers of Jupiter's atmosphere a little more in the scripts, and exaggerated the bump height massively - I wanted to fly a ship down between the layers of clouds. It was pretty cool when I did. I'll post some pictures when I get to my SE machine. I beg to differ on how pretty it is, I'm rather fond of it. While my modifications to Jupiter are certainly not realistic, I enjoy them, but I understand why it isn't a default effect. I'm sure I've seen photographs taken by various Jupiter probes showing relief and shadowing caused by the differing levels of the clouds. It's a small-scale effect, but of course it is there - just as clouds self-shadow on Earth, clouds self-shadow on Jupiter. The effect is probably too small scale to be effectively conveyed at the resolution of a bump map, but I sometimes find the procedural gas giants a little flat-looking - a suggestion of texture is all I'm advocating. Upgraded controls settings menu. It now have mouse axis binds and sensitivity, and independent settings for free camera (planetarium), ship in atmosphere and ship in space controls. So you may in atmospheric flight mode invert Y axis and set X axis to control ailerons (roll) to make controls like in plane simulators. when is this patch released?